I had a very early start today and was eating breakfast in my office at 7:30 am. I was thankful I had made it the night before. 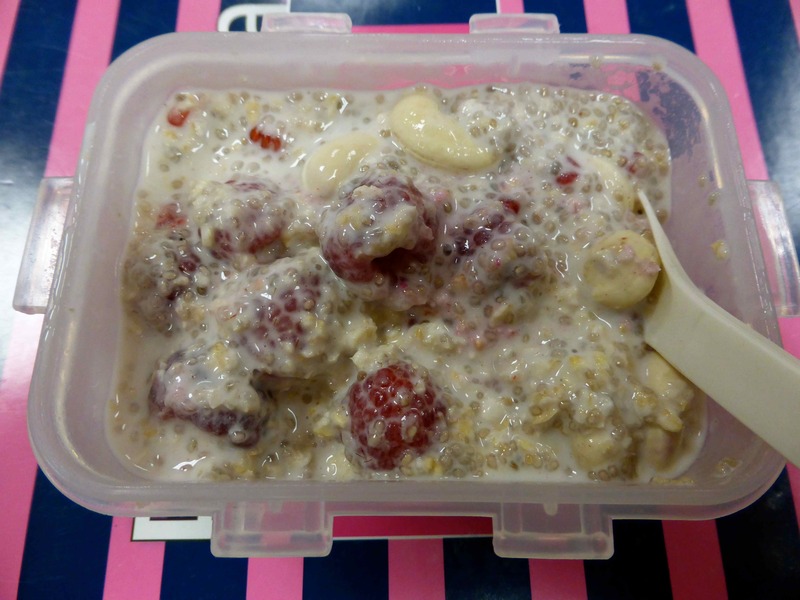 Oats, almond milk, cashew nuts, chia seeds and raspberries. Overnight the chia seeds (10g), nuts (25 g) and oats (40 g) absorb the liquid (200 ml) so the consistency was perfect. 448 calories. I had made salad last night too which I was very relieved about. I was in an all day meeting in a different office and when we broke for lunch it was to eat in the canteen. The food was perfectly adequate but not enough raw food for me. I realised yesterday when I was blogging that I had cooked all my meals. They were all healthy and contained lots of veggies but I am trying to increase the amount of raw food I eat too. So today, to balance things out, everything was raw except the sweetcorn and tuna. 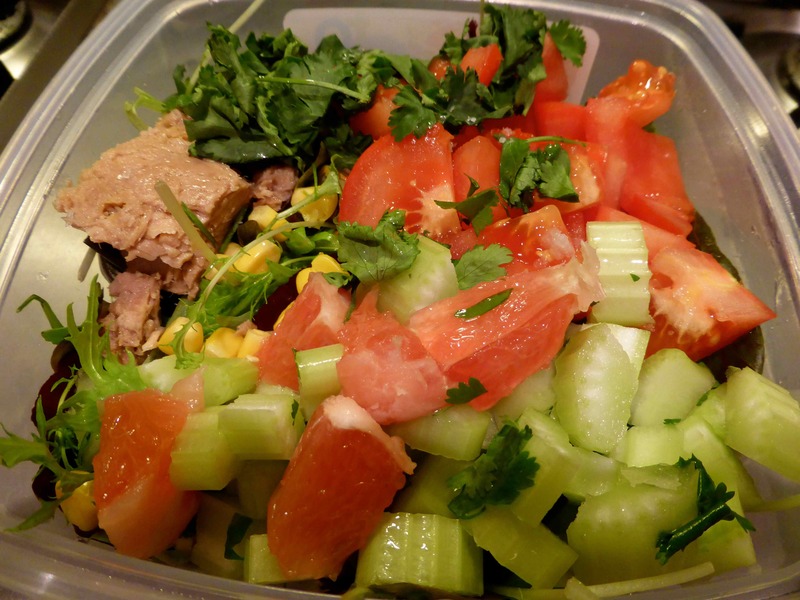 In my salad pot was mainly mixed green leaves, tomatoes, celery, sweetcorn, pink grapefruit (there was a small bit left in the fridge to use up), tuna and coriander. This was not really enough for lunch so I was very hungry when I got home. 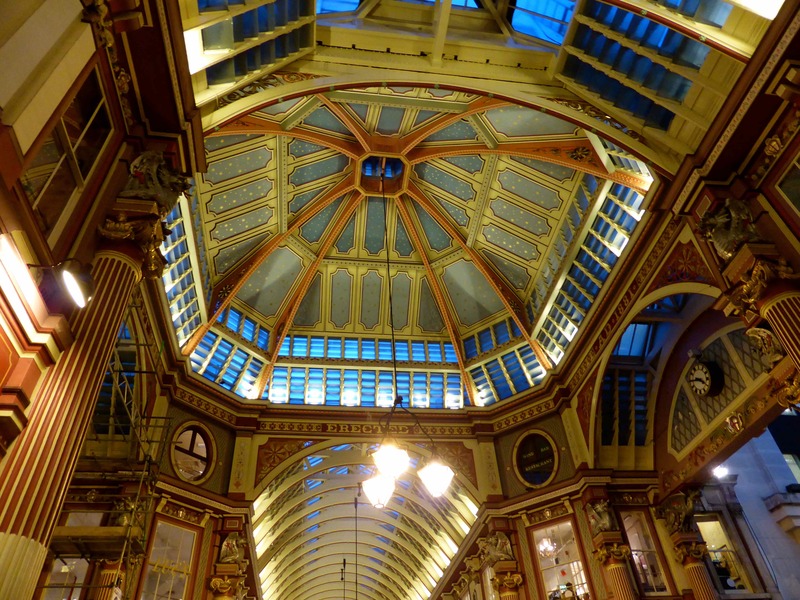 We finished earlier than I expected so I took the opportunity to wander through Leadenhall Market, somewhere I used to go to regularly but where I have not been for ages. 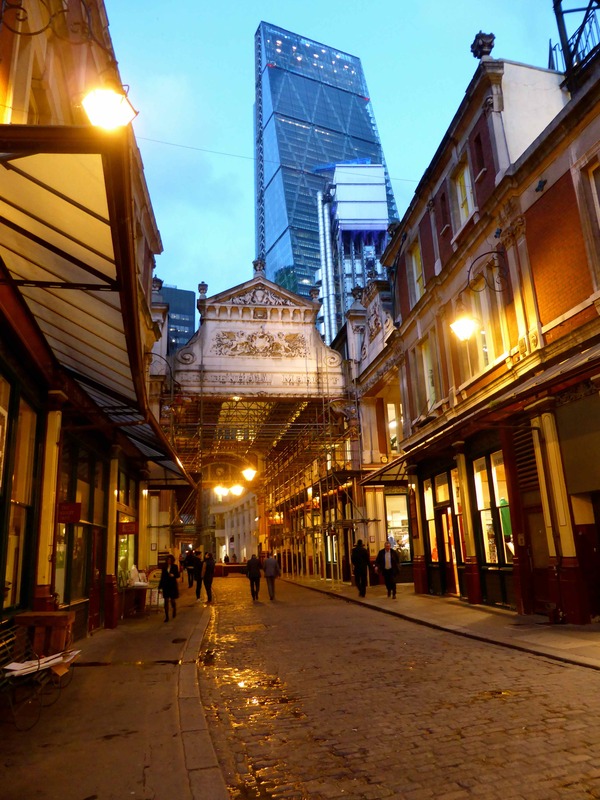 In the background is the top of the Lloyd’s building and the ‘Cheese Grater’. It looks like it has had a paint job since I was last here! 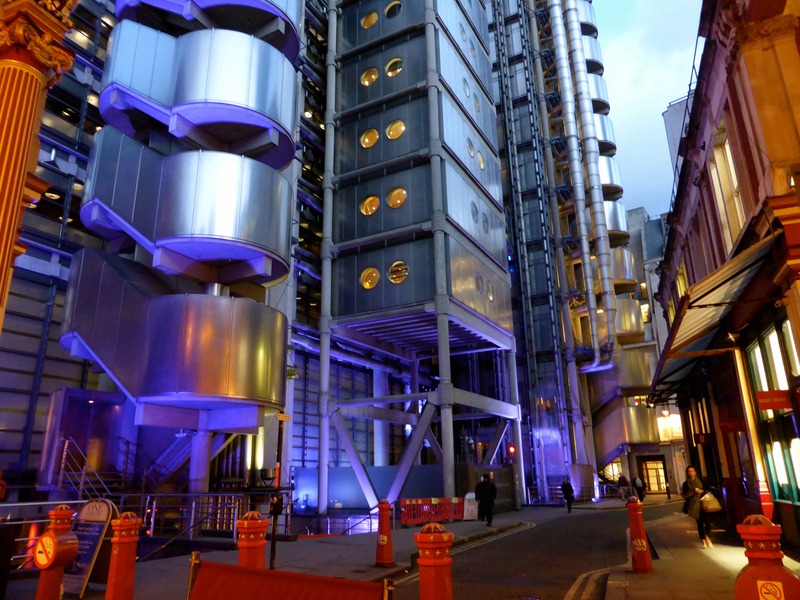 The Lloyd’s Building, home of the insurance market. 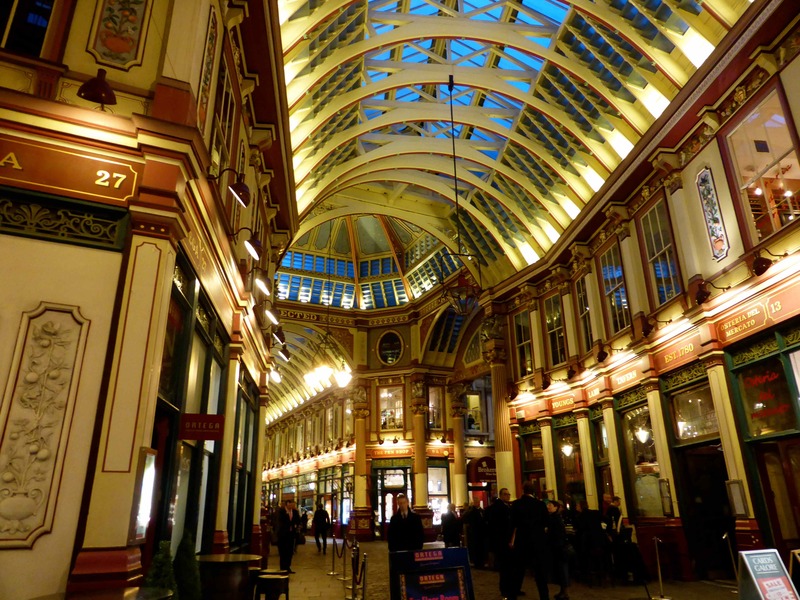 Many years ago I worked next to this market and for years would pop in here to grab a sandwich or similar for lunch. I enjoyed many an evening out at The Lamb, the pub on the right hand side. 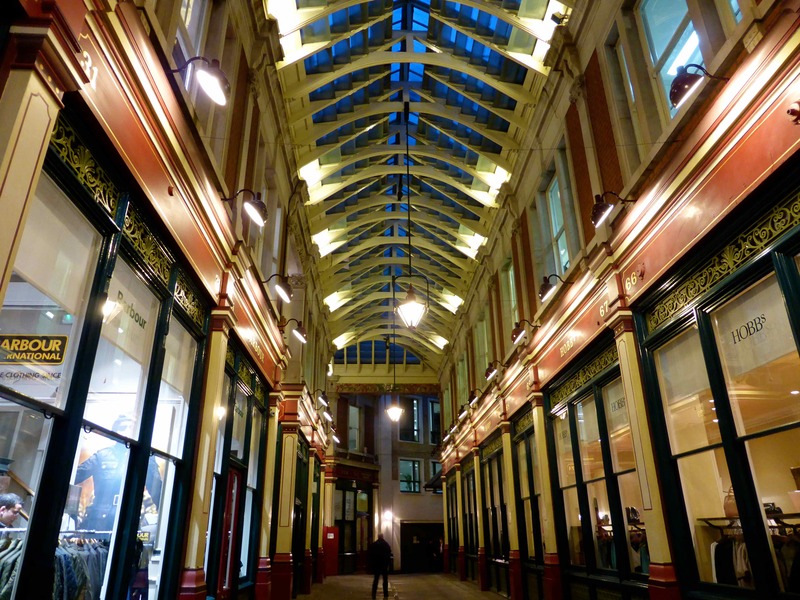 Most of the shops in here have changed since my day but I enjoyed the memories as I wandered around. It is a beautiful building. Back at home I was very hungry and in the mood for something sweetish. 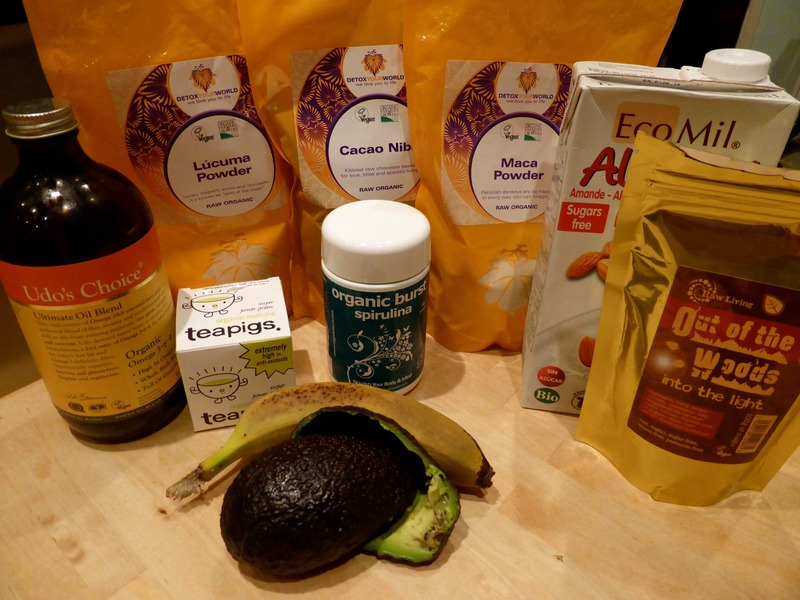 So I made a smoothie with lots of goodies, including cacao nibs and a small banana for some sweetness. No sugar or dairy though so none of my diet rules were broken. I blended it for ages so it was super smooth. I really liked it but this would not appeal to most of you. The taste was unusual but the banana and chocolate were detectable beneath the other flavours and I enjoyed thinking about the goodness this was doing. It did seem very rich so I ate it slowly and enjoyed it all. Another day of healthy eating within calories and with a walk too. One day at a time. 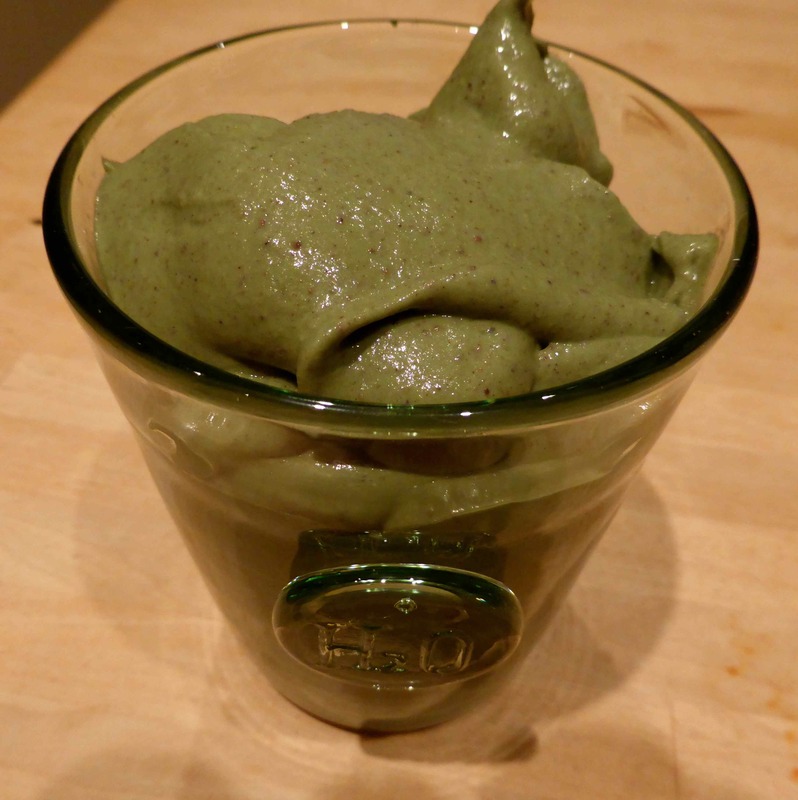 This entry was posted in Uncategorized and tagged Diet, Green Smoothie, London. Bookmark the permalink.